If someone told me a few years ago that I could enjoy the glory of God, I would not have believed it. You see, I’ve grown up in a Pentecostal atmosphere where “taking the glory of God” was considered wrong. I was always told “give God the glory”, “the glory is not for you”. But by reading the Word of God I came to understand that what I have been taught was not based on the Word but just on religious beliefs. The first two verses of Romans 5 helped me to break free from that misunderstanding and understand the purpose of the glory and honor that God wants to give us. THEREFORE, SINCE we are justified ( acquitted, declared righteous, and given a right standing with God) through faith, let us [grasp the fact that we] have [the peace of reconciliation to hold and to enjoy] peace with God through our Lord Jesus Christ (the Messiah, the Anointed One). Paul writing in the book of Romans encourages us to REJOICE in our HOPE of EXPERIENCING and ENJOYING THE GLORY OF GOD. Imagine, we can experience and enjoy the Glory of God! Looking at these two verses bit by bit is so exciting. It shows us the heart of God and helps us to get what God has planned for us. Some people are so afraid of the Glory of God that they keep away from it. 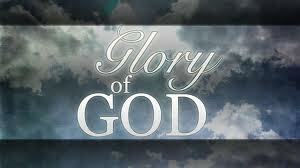 Some even feel that the Glory of God is NOT for them. Before Jesus died, he prayed to the Father and said that the glory and honor that the Father had given him, he was giving it to the disciples, so that they could be one with the Father as Jesus and the Father were one. People are so afraid of the glory of God, but when we look at this verse, it clearly says that the glory and honor is to make is ONE with the FATHER. Hallelujah!!! I want the Glory and Honor, I’m going for the glory and honor! I want to be ONE with my DADDY! O LORD, our Lord, how excellent (majestic and glorious) is Your name in all the earth! You have set Your glory on [or above] the heavens. 2 Out of the mouths of babes and unweaned infants You have established strength because of Your foes, that You might silence the enemy and the avenger. 5 Yet You have made him but a little lower than God [or heavenly beings], and You have crowned him with glory and honor. The GLORY OF GOD is set on or above the heavens. God is mindful of you, and cares for you. He has and never will leave you alone, He is ALWAYS with you. The same passage tells us that He has made us little lower than God himself and has crowned us with GLORY and HONOR. That’s exactly the same thing Jesus prayed – glory and honor. There I will meet with the Israelites, and the Tent of Meeting shall be sanctified by My glory [the Shekinah, God’s visible presence]. 44 And I will sanctify the Tent of Meeting and the altar; I will sanctify also both Aaron and his sons to minister to Me in the priest’s office. When God brought the children of Israel out of Egypt He gave Moses the design for the ark of the covenant and the tabernacle or tent of meeting. This was the place where God would come and speak to Moses and to the people of Israel. However, only Moses could go into the tabernacle / tent of meeting, but the people of Israel could not go in to the tent of meeting, they could only stand outside. God said that He would sanctify the tent of meeting with His GLORY. The tabernacle represented the dwelling place of God on the earth. It was the place where the presence of God would come down and it was the place from where God would speak to Moses. Today we have no tabernacle. It has changed because the tabernacle was a shadow of the things to come. Instead of having the Tabernacle, we have our bodies, where God wants to come and dwell. Do you not discern and understand that you [the whole church at Corinth] are God’s temple (His sanctuary), and that God’s Spirit has His permanent dwelling in you [to be at home in you, collectively as a church and also individually]? What agreement [can there be between] a temple of God and idols? For we are the temple of the living God; even as God said, I will dwell in and with and among them and will walk in and with and among them, and I will be their God, and they shall be My people. Our bodies become the temple of the Holy Spirit when we believe that Jesus is our Lord and Savior. That’s something so awesome! We are the dwelling place of God! And I will be a Father to you, and you shall be My sons and daughters, says the Lord Almighty. When we receive and believe in Jesus we become the sons of God. There is NO more generational curses or forefather spirits that are behind us or connected with us, because we are the sons of God. The GLORY of the FATHER is for His SONS (His children). We are justified through faith in Jesus, and we have access by faith into this grace so that we can experience and enjoy the glory of God.